Chrissy is a Bellevue native who graduated from Gross High School. She earned her BA in Psychology from Saint Louis University and then went on to complete her Masters degree in Physician Assistant Studies at Union College in Lincoln, Nebraska. 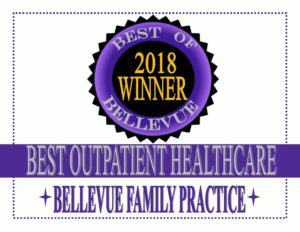 Chrissy began her career at Bellevue Urgent Care when the clinic opened in 2009, and started her career with Bellevue Family Practice in November, 2014. She is happy to continue to serve this community in Primary Care, but is most excited to work alongside her father, Dr. Robert Saniuk. She enjoys working with all patients and recently became Certified in Advanced Bioidentical Hormone Replacement Therapy for men and women. She continues to enhance her knowledge in the field of hormone therapy and preventative medicine. Chrissy and her husband, Dan, were married in 2013 and were thrilled to welcome their daughter, Clara, to their family in early 2016 and Grant in 2018. They enjoy running, biking around Omaha, and being outdoors. During their free time, Chrissy and Dan enjoy cooking, traveling, and spending time with family and friends.